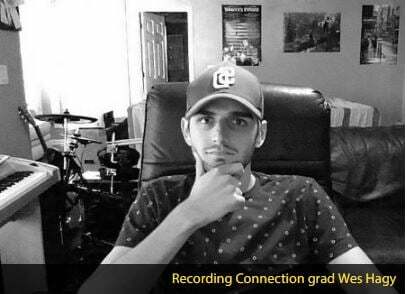 Recording Connection graduate Wes Hagy recently got hired as a tracking engineer at Maximus Music (Jadakiss, Wiz Khalifa, Zaytoven), located in Charlotte, North Carolina. Wes’ own journey into audio engineering and music production has been anything but straight ahead. It takes courage to go against the grain. Although Wes’ parents didn’t agree with his choice to quit school, they supported their son in finding his passion. The love that Wes had for music since he’d first started taking piano lessons during his early childhood soon resurfaced. Then, he met up with Justin Allie, an old friend, and saw he was making beats and hooks. Within months, the two friends were talking about their musical goals and Wes found himself “really intrigued” with the prospect of pursuing music for a living. Wes and Recording Connection mentor Ira Parker connected well right from the start. Ira could see Wes’ passion and that he was invested in learning by doing the homework each week, asking questions, and coming into the studio as much as he could. This ultimately paid off when Ira offered Wes the position of tracking engineer at Maximus. Even though he’s graduated the program, Wes is still heavily invested in learning as much as he can, knowing real knowledge and usable skills come by doing it and being right in the thick of the process, hands-on. Wes Hagy made the difficult decision to change courses in his life. Going from mechanical engineering to audio engineering wasn’t the easiest transition to make but a necessary one. We’re glad to have been able to help Wes get on the right path to building a future that inspires and fulfills him every day. Producer/Engineer Ryan J. Hewitt Endorses Us!